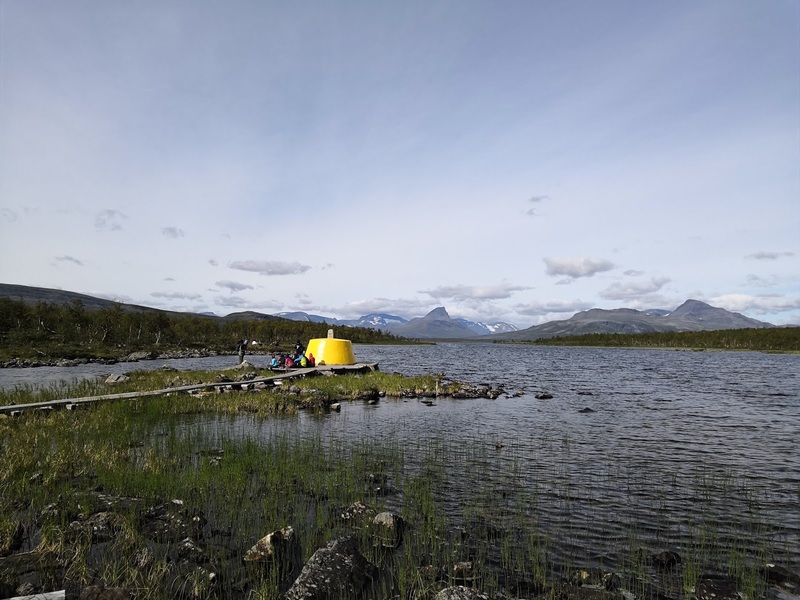 Abisko was not only the end of the Kungsleden but also the "end" of Sweden! I now had to go back into Norway and after my rather negative experiences on the E1 in Norway further south I was less than enthusisatic about this prospect. But this time Norway did not disappoint me - on the contrary: The section on the Nordkalottleden turned out to be the best of this entire hike! This was due to various factors: First of all the trail here was very well marked. There were still some boggy sections but not as excessive as further south. But the landscape was absolutely stunning - and quiet varied. The summer heat wave was more or less over, but the weather was mostly still great with very little rain. 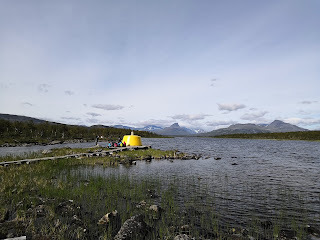 Like on the Kungsleden there were nice huts along the Nordkalottleden as well - but far less crowded and to my big surprise relatively cheap! For a DNT/STF member a night in such a luxury cabin costs just 15 EUR! And that includes sleeping in a real bed with duvet, use of the kitchen with a stove and of course heating with firewood. Still I preferred to camp and never slept in any of these huts - but I used them for lunch break. It was nice to get out of the wind for eating. And studying the entries in the guest book was really entertaining. 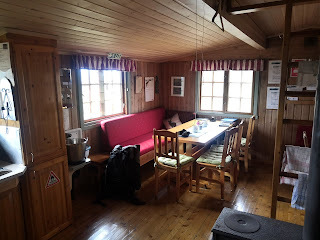 I really liked the huts and was amazed how well maintained and clean they were! I also got some company! 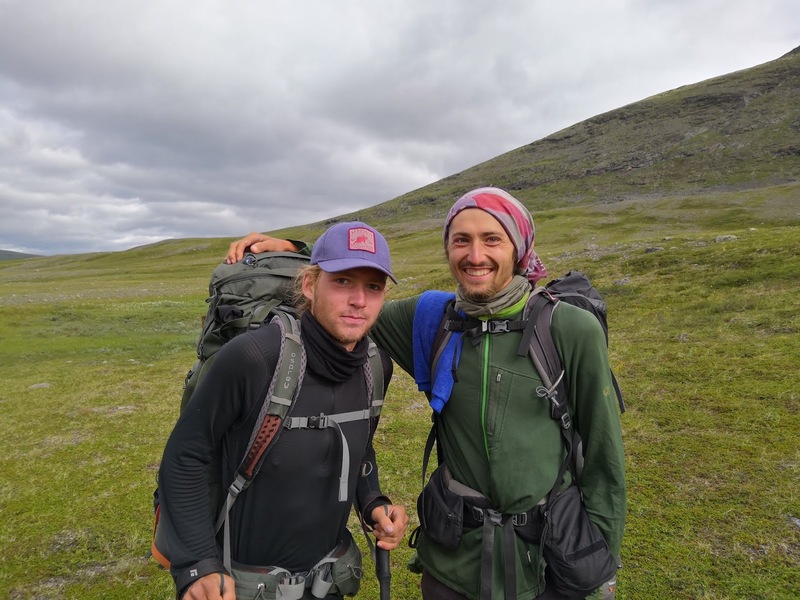 Jonas and Noe were two Swiss hikers doing the entire E1 in Scandinavia. They had been following my log book entries for months when they now finally passed me. Although they are both from Switzerland they talked in English to each other because Jonas is from German speaking Switzerland and Noe from the French speaking part. These two young guys were hiking much faster than me but we kept bumping into each other all the time.They had even hiked with Knut from Norway whom I had met months ago! It was so refreshing for me to swap trail stories and discuss hiking strategies and gear! For both of them this was their first long hike - but probably not the last! I also ran into another "celebrity" on the Nordkalottleden: Martin Kettler greeted me with "Good morning, Miss Thürmer" when I met him in the middle of nowhere. It took me a while to realise who he was. 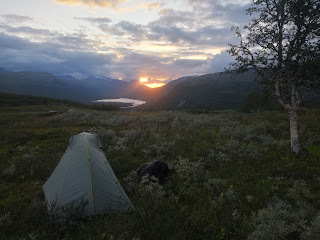 Martin had hiked Norge pa langs a couple of years ago and written a book about it. Now he was back doing short sections of the trail during his holiday. Of course we sat down and chatted about the trail - and about book writing! 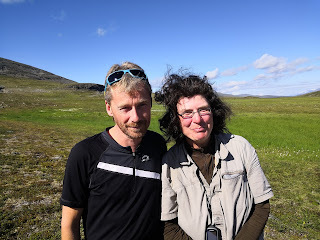 Generally speaking the people I met here on the Nordkalottleden were a lot more experienced than the average Kungsleden hiker. The Nordkalottleden meanders through three countries in this section: Norway, Sweden and Finland and it led me to the famous "Three country stone", a major tourist attraction in this area which gave me some sort of culture shock. Entire school classes were visiting this place that is marked by a huge yellow monument in the middle of nowhere. I didn't find it particularly attractive but the setting is spectacular! From there it was only a short way to a major highway and the Finnish town of Kilpisjärvi! Finnland is the cheapest country in Scandinavia and was incredibly happy to do a cheap resupply including a huge of amount of chocolate that I would not have been able to afford in Norway! Dagmar and Michael are Germans who have immigrated to Norway a couple of years ago. 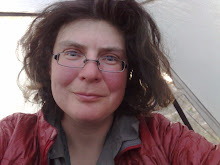 Dagmar had read me first book and when she found out on Facebook that I was hiking through Scandinavia she had invited me stay at their place in Skibottn which is 50 kilometres from Kilpisjärvi. When Michael arrived by car to pick me up I immediately realized that this was going to be one of the highlights of this trip! 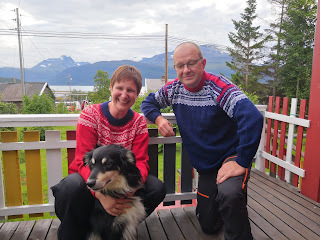 They not only fed me with wonderful Norwegian delicacies but even took me out on the fjord with their boat and let me try out fishing - alas with no result ... And their dog Lilleulv definitely helped me to overcome my dog trauma resulting from my dog bite in June! But most interesting for me was that they told me a lot about Norway and its culture and politics. I hit the trail again very refreshed and with a lot of food for thought!